At the end of this week, on Friday 18 June 2010, the Sisters of Mercy will bless and open a new hospital. This 100-bed hospital will open with 50-beds and limited services this week, and construction and equipment acquisition will continue until its completion, which is anticipated to be August or September, 2010. The new hospital will extend the healing ministry of Mercy to additional people in the Philippines, and the new hospital will also serve as a base for the school of nursing and other health sciences programs of Holy Infant College, Tacloban City. The nursing and health sciences programs at Holy Infant College have approximately 1,000 students. The Sisters of Mercy have been present in the Philippines since 1954 when six Sisters of Mercy arrived in Tacloban City from Cork, Ireland. Tacloban City is in the eastern region of the Visayas islands (the middle section of the three island regions). 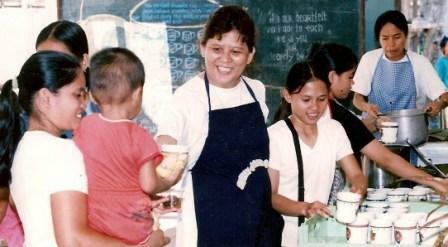 The sisters from this foundation became an autonomous congregation, the Religious Sisters of Mercy, Tacloban Philippines, in 1981. They have 45 members, all of whom live and minister in the Philippines. A second foundation was established in the Philippines in 1957 when four Sisters of Mercy from Buffalo, New York, USA, went to Tubod, Lanao del Norte on the island of Mindanao (the southernmost of the three island regions). The sisters from this foundation belong to the Institute of the Sisters of Mercy of the Americas, NYPPaW Community (New York, Pennsylvania, and Pacific West Community). There are 40 NYPPaW members living and ministering in the Philippines. Today, the Religious Sisters of Mercy live and minister in all three of the island regions of Luzon, Visayas, and Mindanao, and the Sisters of Mercy of the Americas live and minister in the northern- and southernmost regions of Luzon and Mindanao. Taken together, the ministries range health care, housing, education, social services, and spiritual services. In terms of health care, in addition to the hospital opening this week in Tacloban City (Visayas), Sisters of Mercy also own and operate Mercy Community Hospital in Iligan City (Mindanao). This hospital began in 1977 to help the desperate health needs of the people. It also serves as a training hospital for three nursing schools. Mercy Mobile Clinic travels the highways of mountainous regions of the Philippines to provide health services to people who are economically poor and have no means of transportation to the cities. McAuley Herbal Clinic offers women basic health education, skills with herbal medicine, and counsel in feeding malnourished children. In addition, this herbal clinic provides nutritious food to pregnant mothers. Its main purpose is to empower women to counteract the effects of globalization. Mercy Community Hospital has a housing program in which employees of the hospital are provided low-cost homes at Mercy Heights in Iligan City (Mindanao). After 25 years of employment, the home is theirs to keep. Transportation is provided between Mercy Heights and Mercy Community Hospital. Mercy schools are found in all three of the island clusters, although the vast majority of the schools are on the southern two island clusters. In Luzon, Catherine McAuley Learning Center in Manila offers kindergarten. 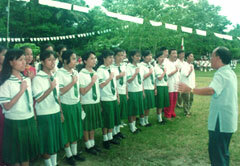 In the Visayas region, Assumption Academy in Tanauan, Leyte, offers kindergarten and secondary education; Cathedral School of La Naval in Naval, Biliran, and Holy Child High School in Villaba, Leyte, both offer secondary education; and Holy Infant College in Tacloban City offers kindergarten, elementary, secondary, tertiary and post graduate programs. Finally, on Mindanao, Columbia St. Michael Parish High School in Mahinog, Camiguin, and Holy Cross High School in Phillips, Bukidnon, offer secondary education; Holy Cross High School in Kolambugan, Mercy Junior College in Tubod, Sacred Heart Academy in Bugo, Cagayan de Oro City, and School of St. John the Baptist in Misamis offer kindergarten, elementary, and secondary education; and Fatima College of Camiguin in Mambajao, Camiguin, offers kindergarten, elementary, secondary, tertiary, and post graduate programs. Some of the social services provided include: McAuley Center where women and children fleeing violence and a life of despair are given a safe home and supportive services; a feeding program for children and elderly who are economically poor; a livelihood program for women who are unemployed; and shelter assistance for persons who are homeless. A House of Mercy exists in Lala, Lanao del Norte (Mindanao), which offers religious education for women, is open to those who need a place to pray or be in solitude, provides herbal medicines to families who are unable to afford commercial medicines; and helps women who are economically poor supplement their income through the manufacture and sale of herbal syrups, soaps, and candles. A spiritual leadership program in Dango, Ozamis City (Mindanao) responds to the needs of and for spiritual directors by teaching skills in counseling and spiritual direction and offering a 40-day Ignatian retreat. This program was established in 1985.
coordinating and supporting other groups and organizations working for the welfare and betterment of the poor, deprived, oppressed and exploited. In early May, the Sisters of Mercy in the Philippines requested prayers for peace and safety for all Filipino people as the Philippine National Election took place on May 10. Despite violence before, during and after the elections, overall the process was a success. After investigation of some irregularities in voting, no fraud was detected. Letty de los Santos rsm says in her expression of gratitude for the prayers: ‘Your prayers gave and strength and courage to stand with our conscience…. We were rained with tremendous prayers from you, our Mercy sisters, and people from different denominations all over the world.’ Please continue your prayers for the people of the Philippines as they prepare for the peaceful transition from former President Gloria Macapagal Arroyo to the new administration.